Meditation - the technique of mental focusing for enhanced awareness and self-mastery - offers deep and lasting benefits for mental functioning and emotional health, as well as for physical health and well-being. 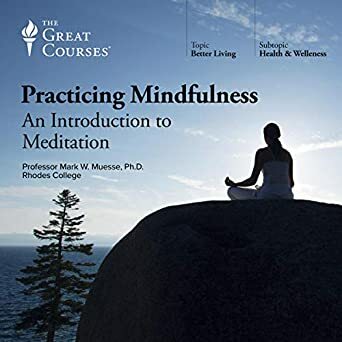 This practice is closely related to "mindfulness," which Professor Muesse defines as "a deliberate way of paying attention to what is occurring within oneself as it is happening. It is the process of attentively observing your experience as it unfolds, without judgment or evaluation." "Meditation," he adds, "refers to certain exercises that can be used to enlarge and refine mindfulness." Meditation cultivates mindfulness by training you to develop deep attention to the present moment, allowing the mind to become settled and centered. These 24 detailed lectures teach you the principles and techniques of sitting meditation, the related practice of walking meditation, and the highly beneficial use of meditative awareness in many important activities, including eating and driving. You will also learn how to use the skills of meditation in working with thoughts and emotional states, in deepening sensory awareness of the body, and in becoming deeply attentive to the operation of your mind. You'll come away with a solid basis for your own meditation practice and for bringing meditation's remarkable and empowering benefits to every aspect of your life.